1st Sgt. Chris McKeand presents additional appropriation requests to the Kosciusko County Council. WARSAW — The county will be surrendering funds to the state of Indiana that have been in local coffers since only a few decades after the British surrendered to the fledgling United States and set sail back to England. At the regular monthly meeting of the Kosciusko County Council, County Treasurer Rhonda Helser submitted a resolution for approval to release funds back to the state that first arrived before Indiana was a state and Kosciusko was a county. Council President Sue Ann Mitchell said the move would eliminate a lot of record keeping in Helser’s department. The amount in the fund is $28,129.47. “It has become quite cumbersome to invest $28,129 on a regular basis,” said Mitchell. “This is money that came to the county in the 1800s. This (surrendering) had been authorized by the state in the last few years.” The council approved the move and the transfer will be finalized May 26. According to Helser, the original allotment was issued to the area on April 19, 1816. It was made possible by an act of Congress. Indiana was not officially welcomed into the union as a state until later that year. Kosciusko became a county in 1836. According to Helser and Auditor Michelle Puckett, it is not clear what governing agency first received the money, since the area was still not incorporated as a county. It’s also not 100 percent clear how much the original allotment was. However, for 203 years, the money has been invested, with the interest dispensed twice annually to local schools. The distribution was based on the number of students, which lasted until 1932 when student counts were replaced with another means of distribution. At the time of the creation of the fund, six of the 56 signers of the Declaration of Independence were still living, including the second and third presidents, John Adams and Thomas Jefferson. Indiana would not become a state for another seven months and Kosciusko would not become a county for another 20 years. Two decades after the establishment of this fund was also the year that Jim Bowie and Davy Crockett gave their lives defending the Alamo. It would be the better part of seven decades before the county would build its iconic courthouse. Abraham Lincoln was seven years old. 1816 was also the year that the world experienced severe global cooling as a result of a catastrophic volcanic eruption the year before. It was referred to as the Year Without A Summer. The University of Warsaw was established in Poland in the town that would become the namesake of Kosciusko County’s seat. In other news, the board approved an additional appropriation of $186,300 in the Louis-Dreyfus Tax Increment Financing district for infrastructure improvements. 1st Sgt. 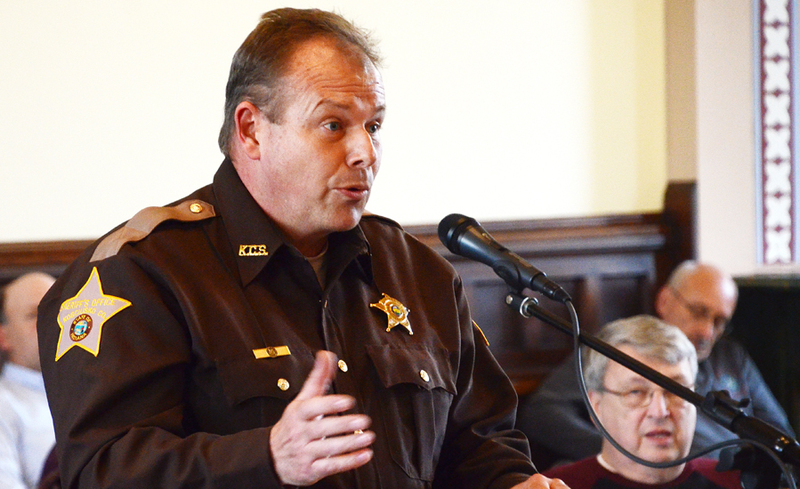 Chris McKeand, representing the Kosciusko County Sheriff’s Office, presented additional appropriation requests for $20,000; $38,400 and $15,000. The appropriations were for salaries for DUI enforcement, Operation Pull Over and DNR Marine Patrols. Highway Department Superintendent Scott Tilden requested an additional appropriation of $73,188 for a truck replacement. The board approved an ordinance granting the use of Records Perpetuation Fund to supplement the 2019 budget.